Description: the small Spinosaurus figure stands in a walking posture, with its left leg posed forward and the left arm raised, its mouth opened as if roaring and the end of the tail bent pointing to the right. The entire animal is painted bright blue, save for the belly which is coloured beige instead. Also, a red stripe runs from the back of the head over the neck and back to about half way of the tail: the sail, which is positioned right in the middle of this stripe, is also red. On either side of the figure, another red stripe runs from the neck over the flank to the very top part of the upper leg. Both of these red stripes contain a very thin black stripe within them. This Spinosaurus has white teeth, a dark pink tongue and inside of its mouth, black edges around the mouth, small black eyes, black claws on its feet (not on its hands) and a black JP logo on its right upper leg. The T-Rex stands in an aggressive posture, its head curved to the left and its arms outstretched as if attacking something. The tip of the tail is bent pointing upwards and to the left. It has small pads on its feet to give it extra support. It's mainly coloured dark beige (or very light brown), except for its underside (throat and belly) which is light yellow instead. A thick red stripe runs from the nostrils over the head, neck and back to the front upper part of the tail, while on its head, neck and back various smaller red stripes run out of this main stripe. Additional red stripes are found on both upper legs and the lower jaw. The T-Rex has white teeth, a dark pink tongue and inside of its mouth, black edges around its mouth, small yellow eyes (with black pupils and black eye liner), black claws on its feet and hands and a black JP logo on its left upper leg. 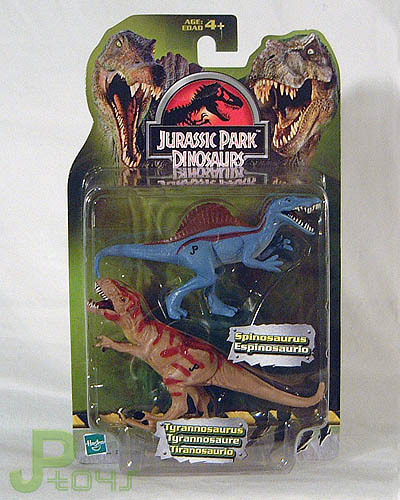 Analysis: an obvious combination of dinosaur figures for Hasbro's dinosaur two-packs for this line (as well as all of the following lines) is this pairing of a T-Rex with a Spinosaurus, so kids (and playful/bored collectors) can re-enact the infamous battle between both super predators from JP III in miniature. That would be pretty dull considering neither figure has any moveable parts, so all you can basically do is bash them against each other. The paint jobs are not the most impressive shows of Hasbro talent of this line. The Rex is downright ugly, and while the Spinosaurus' original colour scheme has some appeal, it's rather monochromatic. More effort should have been given in both cases, and judging from the identical Rex/Spinosaurus pairings still to come, this was never tried since these successors were also a big let-down. So who would win this fight? Why, the T-Rex of course. Not because it is the king of dinosaurs as some avid fanboys keep reminding us, but simply because it is by far the heaviest of both sculpts and easily knocks over its rival. Repaint: yes. Both figures are repaints of dinosaurs that originally came with human figures for the JP III line. The T-Rex teamed up with the Military General, while the Spinosaurus came with Amanda Kirby. Both figures have been repainted before for JP III Camo-Xtreme, and would be repainted several times again for this line, JPD3 and JP 2009. Overall rating: 4/10. There's nothing new to both sculpts, nor are these paint jobs especially appealing. Like most dinosaur two-packs from JPD2 and JPD3, this is one of the more common releases and it can still be found with little effort, usually for low prices – not surprisingly – because they're just not in high demand.